Soup – FOOD IS LIFE! 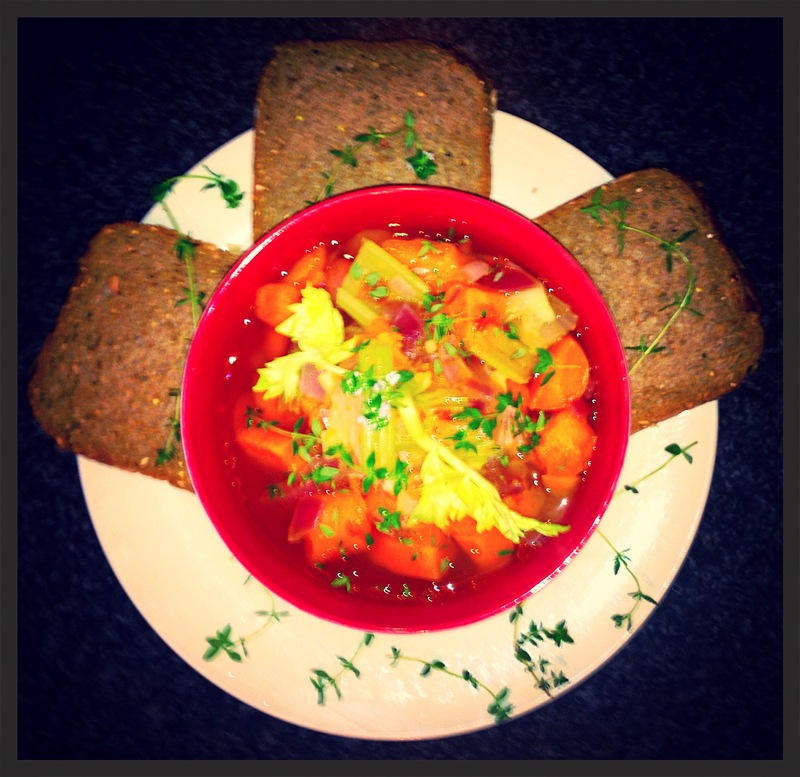 Karina’s Super-Healthy Thyme, Carrot and Garlic soup with Supergrains Bread! Add one tablespoon of olive oil to a large pot, then place on the stove. Turn the heat to medium. Wait for a few seconds, until the oil heats slightly, then add your onions and stir fry for 1 minute only. After 1 minute is over, add your garlic, then stir fry for 20 seconds, until aromatic. Once aromatic, add your vegetable stock, your carrots and sweet potato. Bring this to a boil and cook, stirring occasionally, for 10 minutes, or until just under cooked. Ladle your soup into a medium-sized bowl. Drizzle a little olive oil and tabasco sauce over your soup. Finish by sprinkling your thyme leaves over your soup. Serve with lovely toasted supergrains bread! 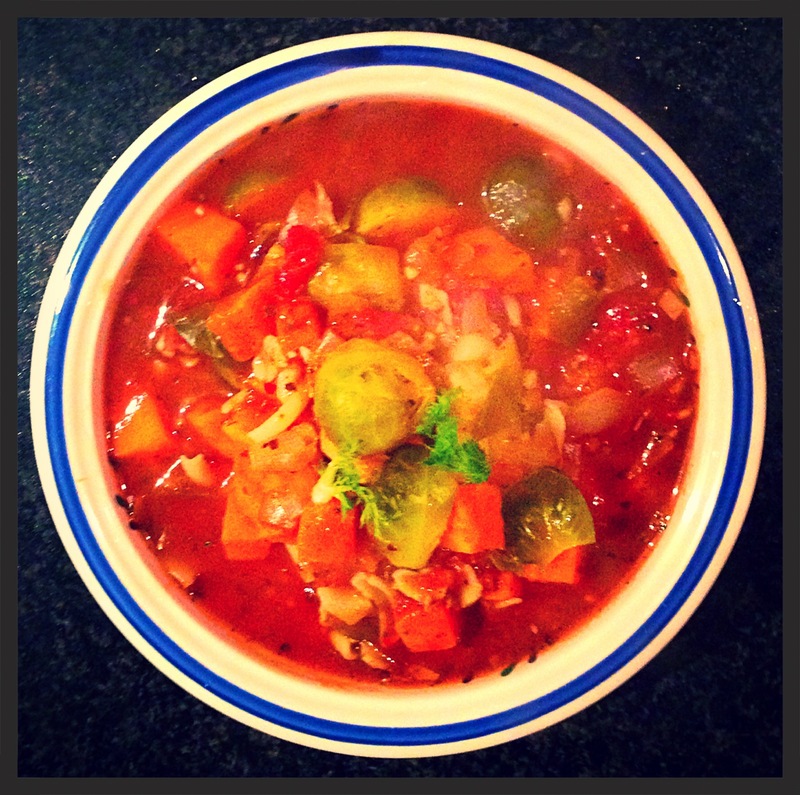 Karina’s Super Healthy Chicken and Vegetable Soup with Buckwheat Noodles! Using a medium sized pot, bring 1.5 litres of water to the boil, adding the stock powder to form a vegetable stock. Once water has been brought to the boil, add your garlic, chilli, ginger, sweet potato, hoisin sauce, sesame oil, soy sauce and black pepper. Boil for 8 minutes, or until sweet potato is cooked. Note: while your sweet potato is cooking, you can cook your buckwheat noodles as per packet directions. Aim for 100 g of buckwheat noodles per person. After buckwheat noodles have cooked, strain well, then place at bottom of serving bowls. After your sweet potato has cooked, turn the heat down to a simmer, then add your corn, red spinach, kale, shallots and chicken to the pot. Put the lid on, then cook for 5 minutes. After 5 minutes are over, or when the chicken has cooked, turn the heat to off, then pour the hot and nourishing soup over your buckwheat noodles. 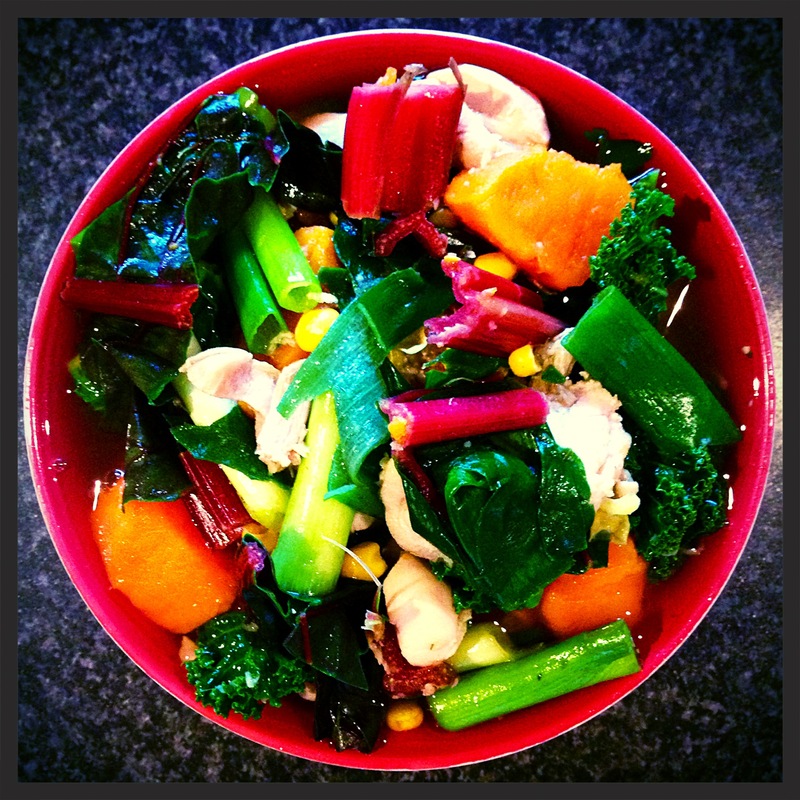 Savour your nourishing bowl of beautiful, healthy soup! 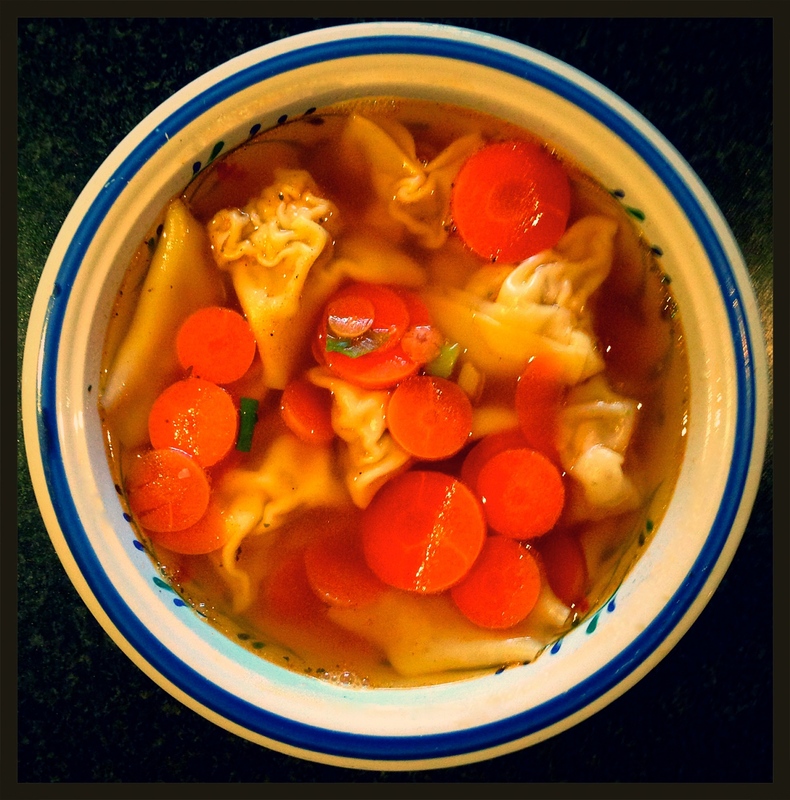 Karina’s light and Spicy Chicken ‘wonton’ soup! Clean your kitchen bench well, wipe dry, then lay your wonton wrappers across your kitchen bench. Make your wonton filling by combining all the ingredients for the wonton filling together, in a small bowl, then mix well to combine. Scoop 1/2 a teaspoon of wonton mixture into each wonton, then lightly brush two sides of the wonton wrapper with water (it should be the two sides that form a triangle). Fold your wonton wrapper over, to form a sealed triangle shape. You can either have triangle wontons, or you can experiment with different shapes. Grab a large soup bowl, then pour your broth and wontons in this bowl. Sit in a warm place to enjoy your comforting and spicy soup. Using a large pot, heat one tablespoon of olive oil, over medium heat. Once oil has heated through, add your bacon and fry until crispy and slightly caramelised. Once bacon is crispy, add your onion, then cook until translucent, stirring occasionally. Once translucent, add your onion, then fry for 30 seconds. Add your balsamic vinegar to the pot, then cook this off until slightly reduced (about 1 minute), then stir. Add your vegetable stock powder to the pot, whilst adding your water to the pot, simultaneously, then give the whole mixture a good stir. Add your can of chopped tomatoes, then stir. Add all your vegetables to the pot at the same time (sweet potato, brussels sprouts and fennel). Then add your pasta immediately after. Once the pasta has been added, add your hot chilli sauce, mixed italian herbs and black pepper, then stir well and allow to cook, on the same heat setting (medium heat) for about 8 minutes, or until vegetables are cooked. Serve your soup in a large bowl. Relax in a warm place, enjoying your nutritious and comforting bowl of Minestrone!